Recombinant fragment within Human Chk2 aa 1-200. The exact sequence is proprietary. WB: HeLa (untreated and treated with gamma irradiation), HT-29, and 293T cell lysates. IHC-P: Human colon and spleen tissues. ICC/IF: Wild-type HAP1 cells. Our Abpromise guarantee covers the use of ab109413 in the following tested applications. WB 1/50000 - 1/200000. Detects a band of approximately 62 kDa (predicted molecular weight: 61 kDa). Regulates cell cycle checkpoints and apoptosis in response to DNA damage, particularly to DNA double-strand breaks. Inhibits CDC25C phosphatase by phosphorylation on 'Ser-216', preventing the entry into mitosis. May also play a role in meiosis. Regulates the TP53 tumor suppressor through phosphorylation at 'Thr-18' and 'Ser-20'. Defects in CHEK2 are associated with Li-Fraumeni syndrome 2 (LFS2) [MIM:609265]; a highly penetrant familial cancer phenotype usually associated with inherited mutations in p53/TP53. Defects in CHEK2 may be a cause of susceptibility to prostate cancer (PC) [MIM:176807]. It is a malignancy originating in tissues of the prostate. Most prostate cancers are adenocarcinomas that develop in the acini of the prostatic ducts. Other rare histopathologic types of prostate cancer that occur in approximately 5% of patients include small cell carcinoma, mucinous carcinoma, prostatic ductal carcinoma, transitional cell carcinoma, squamous cell carcinoma, basal cell carcinoma, adenoid cystic carcinoma (basaloid), signet-ring cell carcinoma and neuroendocrine carcinoma. Defects in CHEK2 are found in some patients with osteogenic sarcoma (OSRC) [MIM:259500]. Belongs to the protein kinase superfamily. CAMK Ser/Thr protein kinase family. CHK2 subfamily. Nucleus; Nucleus. Isoform 10 is present throughout the cell and Nucleus > PML body. Nucleus > nucleoplasm. Recruited into PML bodies together with TP53. ab109413 was shown to specifically react with Chk2 when Chk2 knockout samples were used. Wild-type and Chk2 knockout samples were subjected to SDS-PAGE. ab109413 and ab8245 (loading control to GAPDH) were diluted 1/50 000 and 1/2000 respectively and incubated overnight at 4°C. Blots were developed with Goat anti-Rabbit IgG H&L (IRDye® 800CW) preadsorbed (ab216773) and Goat anti-Mouse IgG H&L (IRDye® 680RD) preadsorbed (ab216776) secondary antibodies at 1/10 000 dilution for 1 h at room temperature before imaging. ab109413 staining Chk2 in wild-type HAP1 cells (top panel) and Chk2 knockout HAP1 cells (bottom panel). The cells were fixed with 100% methanol (5 minutes), permeabilized with 0.1% Triton X-100 for 5 minutes and then blocked with 1% BSA/10% normal goat serum/0.3M glycine in 0.1% PBS-Tween for 1 hour. The cells were then incubated with ab109413 at 1/250 dilution and ab195889 at 1/250 dilution (shown in pseudo colour red) overnight at +4°C, followed by a further incubation at room temperature for 1 hour with a goat secondary antibody to Rabbit IgG (Alexa Fluor® 488) (ab150081) at 2 μg/ml (shown in green). Nuclear DNA was labelled in blue with DAPI. Immunohistochemical analysis of paraffin-embedded human colon tissue using ab109413 at a 1/100 dilution. Flow Cytometry analysis of HeLa (human cervix adenocarcinoma) cells labeling Chk2 with purified ab109413 at 1/230 dilution(10 µg/ml) (red). Cells were fixed with 80% methanol and permeabilised with 0.1% Tween-20. 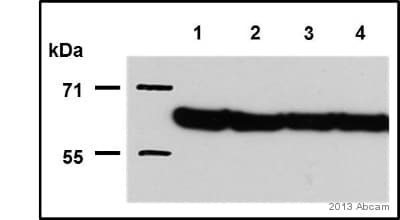 A Goat anti rabbit IgG (Alexa Fluor® 488) (ab150077) (1/2000 dilution) was used as the secondary antibody. Rabbit monoclonal IgG (Black)(ab172730) was used as the isotype control, cells without incubation with primary antibody and secondary antibody (Blue) were used as the unlabeled control. Lanes 1 - 4: Merged signal (red and green). Green - ab109413 observed at 64 kDa. Red - loading control, ab8245, observed at 37 kDa. 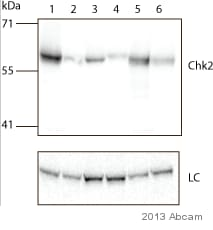 This western blot image is a comparison between ab109413 and a competitor's rabbit polyclonal antibody. Immunohistochemical analysis of paraffin-embedded human spleen tissue using ab109413 at a 1/100 dilution. ab109413 (1/500) staining Chk2 in HeLa (human epithelial cell line from cervix adenocarcinoma) cells (green). Cells were fixed in paraformaldehyde, permeabilized with 0.5% Triton X-100/PBS and counterstained with DAPI in order to highlight the nucleus (red). For further experimental details please see Abreview. Publishing research using ab109413? Please let us know so that we can cite the reference in this datasheet. I did not get any results that resembled the graph that you have on the website and was wondering if it was the conditions. Below you can find the tested WB protocol. - Add protease and phosphatase inhibitors. - 1X protease inhibitor mixture consists of 2 mM AEBSF, 1 mM EDTA, 130 μM bestatin, 14 μM E-64, and 0.3 μM aprotinin. Westerns are performed using cell lysates from harvested cells. 2.1.1 Grow cells to ˜90% confluency. 2.1.4 Transfer cell lysates to Eppendorf tubes and sonicate for 10-15 seconds. 2.1.5 Spin at 14,000 rpm, 4 °C for 10 minutes. 2.2.4 Sonicate for 10-15 seconds. 2.2.5 Spin at 14,000 rpm, 4 °C for 10 minutes. 2.3. Remove a small volume (50 ul) to perform a protein assay. Determine the protein concentration for each cell lysate. 2.4. To the remaining volume of cell lysate, add an equal volume of 2X Laemmli Sample Buffer (final concentration of 1 mg/ml). 2.5. Boil each cell lysate in sample buffer at 100 °C for 5 min and aliquot. Use a 26-gauge needle to shear released chromatin. Store lysates at -20 °C. Note: Aliquot cell lysates (50-100 μl) in order to avoid repeat freeze/thaw cycles. 2.6. Defrost tubes containing cell lysate at 37 °C. Centrifuge at 14,000 rpm in a microcentrifuge for 5 min. 2.7. 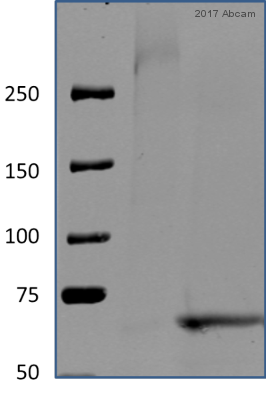 Load equal amounts (10-20 μg) cell lysate onto SDS-PAGE gels using gel loading tips, along with molecular weight markers. 2.8. Run gels and transfer for western blotting. 3.1. Block nitrocellulose for 1 hour at room temperature or overnight at 4°C using 5% BSA or 5% NFDM. 3.3. Wash nitrocellulose with three 5-min washes using TBST. 3.4.Incubate nitrocellulose with goat anti-rabbit HRP antibody, diluted to 1:500 to 100,000 in 5% BSA or 5% NFDM, for 1-2 hours at room temperature. 3.5. Wash nitrocellulose in 3 washes of TBST, then rinse in TBS prior to addition of chemiluminesence reagents. 3.6. Remove excess chemiluminescence reagent and sandwich nitrocellulose blot in any type of transparent plastic wrap (plastic cling wrap, transparent sheet protector, etc.). 3.7. Acquire image using darkroom development techniques.